Help us make a difference! There are three important ways to receive our messages and stay engaged with our mission. We hope you will do all three or at least one: become a fan of the Michael Josephson Facebook page and the CHARACTER COUNTS! 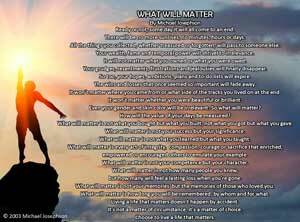 Facebook page, and subscribe to and regularly visit the What Will Matter website, and receive our weekly newsletter. I was one of the pioneer participants at the character Counts seminar in Lagos Nigeria from october 27th -28th, 2011 from Grange School. It was a truly wonderful seminar. We have given out to the students the charcter counts school Agenda. I will be presently a seminar in no distance time once a date is fixed by management. Thanks so much Prof and keep up the good work. Keep up the great work Mr. Josephson. You are an inspiration.